Just regular folks. : Hoping for a bird. For the past year or so, I've been thinking about getting a bird. I don't think I will really ever get a bird, I just like thinking that I might someday get a bird. A few months ago, I was reading a book called Alex & Me to the kids about an amazing parrot (who spent some time at MIT kind of around the time that I was there) who could count and recognize colors and do simple cognitive exercises - I think they said in the book that the bird had the mental capacity of maybe a 2 year old and I remember thinking that that damn bird was so far ahead of what Edda has ever been able to show us, I was jealous. I was jealous of a bird. But, I was kind of determined not to let that thought depress me, rather, I was going to use some of the pedagogical approaches that they mentioned in the book and use them with Edda to see if she could learn in the same way. 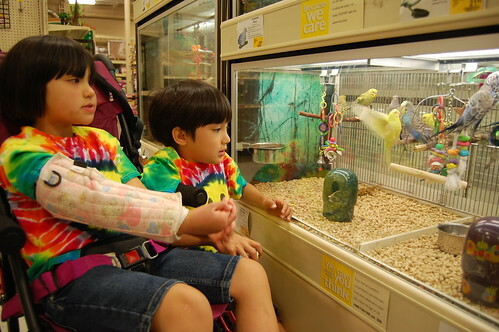 The author did mention that her methods of teaching Alex the bird had been used for special needs kids, so what the heck, maybe Edda could benefit from the bird model. After we finished the book, I hadn't really thought much about birds until today. We went to PetSmart today to get some Ruby supplies and we spent some time watching the birds. Edda seemed to enjoy watching them flit around which reignited my desire for a bird. My mind drifted to a fantasy image of a beautiful bird perched on my shoulder as I spent my day examining patents. The bird would poop in a designated spot and be somewhat conversational in a Polly-Want-A-Cracker type of way. (Some people dream of tropical vacations, apparently I like to dream about birds.) Then I got all sad and thought that my fantasy bird would be more talented than my daughter, that the bird could verbally ask for a cracker and also be potty-trained. A mild depression set in. Then I thought about it a little bit more. I realized that a bird can to more than any other child on the face of the planet. A bird can fly. Ha! I felt better immediately. Hi, Edda knows everything as I observed. She definitely knows more than a bird. The problem is she could not express her knowledge since she could not control her muscles just like old person had a stroke. Therefore, force her to use her muscles – what the therapists do – would definitely help. Of course, I am not a medical doctor. Feel bad about Edda's situtation is fairly normal. But, don't let it get to you all the way and all the time. Life has more facets than just one, like diamonds. With one isn't exactly shaped, the "rest" can certainly make it up. This way, of course, it still far from perfect. But, it is much, much better. This "rest" consists of other things in one's life which are treasured too. They are more controllable and predictable if one cultivats them. Treasure them and they will glow and shine even more to help the un-perfect one better. I wish Edda didn't have Rett. But, to me, she is uique and lovely. She is always in my mind, especially her smiles and getting mad.